We try to make the quote and order process as simple as possible but it’s important to collect as much information about your order to ensure we provide the best print service. If you are unfamiliar with the order process we have outlined the various stages of the print process and provided some useful downloads below. In order to build a quote you will need to fill out our quote request form online. You will need to meet our minimums and have artwork in an illustrator or photoshop format. Once we have your artwork and order details we will send an invoice for your approval. We ask for full payment upfront before we can start on any order. Once the order is confirmed we will send a final visual mockup for your reference and approval. This is a final visual check of your artwork and print placement. Sit back and leave the rest to us! Artwork needs to be prepped,films need to be output, screens need to be burned and finally print your wonderful products. Depending on the complexity and size of your order we will typically have your order printed and ready for postage or collection within 1 – 2 working week. 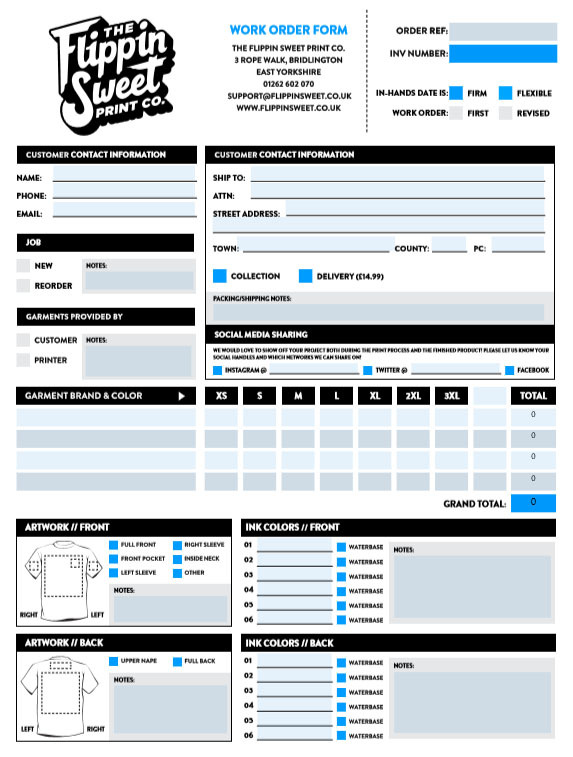 We put together the work order form to make the screen printing process easier and more accurate. If you are new to screen printing you may be overwhelmed with choices and new information. We have put together a short overview guide below to help you get started. Filling out a work order form is to help make sure we provide your order as you requested. We recommend submitting an order form for both new and repeat orders. Please fill out all the basic information, including your name, company name, billing address, postage address (or collection), date and due date of the order. Be sure to add your artwork name and information to this section. This is very important, so we can keep your designs organized. In the garment, brand and style section please fill out as much information about the garment as possible such as the color and size breakdown. Be sure to add all the details of your artwork in the lower part of the form. Include a graphic name, let us know if it’s a new graphic or a re-print. Please tick the appropriate print placement or multiple if required. Front or back etc. Include pantone numbers if possible, if not please list the ink color names your graphic has. (ex: red, white and blue.) Be sure to add any special request in the empty box below. If you wish to provide more information to help the print process such as print placement measurements, garment details etc. We have a range of extra forms to accompany the Work Order Form. You can provide your own visual mockup with our editable AI shirt template. Place your vector artwork and include your print size. Download our “Rule of Thumb” print placement poster. Showing measurements between the bottom of the garment neck collar and top of the print. I'm not ready to order yet, can i get a quote? If you’re not ready to place an order just yet, you may be looking to request a quote or download our price matrix to give you a general overview on print and finishing pricing. Once you’re ready to go ahead with an order, download our order form and submit with your print details and customer information as below. What happens after i submit an order form? Once we have received your order form via email (email to support@flippinsweet.co.uk) we will provide an approved invoice using the infomation on the order form. If you have submitted your artwork files we will provide a visual reference mockup. Do i need to submit an order form for every order? More often than not even repeat orders have changes, for example different size quantities or an alternative postage address. This is why we recommend always submitting an order form for every order including repeat orders.